Probably the most popular articulated design, the Beyer-Garratt was devised in 1907 and brought about a breakthrough in steam locomotive design. Please visit Gavin Hamilton's magnificent Garratt site to obtain a nearly complete overview of all Garratts ever built. A Garratt has two bogies, like a Kitson-Meyer or a Modified Fairlie, but the boiler was slung between them on a frame. The tanks and bunker are carried on the bogie units, leading to an enormous amount of articulation. The bogie units are facing outward so one unit always runs "forward" and the others "backwards" and vice versa. The boiler is relatively short and and wide which is thermally a very efficient shape. The firebox on the sub-frame has plenty as space so it can be designed wide and deep, leading to a large grate area. This way the Garratt design lent itself to the successful burning of low-grade fuels. All these factors led to easily steaming boilers, producing sufficient steam to feed all four cylinders directly. Only a few Garratts were built as compound locomotives. The Garratt is named after it inventor Herbert William Garratt (1864-1913). Garratt, Inspecting Engineer for the New South Wales Government, turned to Beyer Peacock with his version of locomotive articulation. The patent drawing from 1907 shows a 2-4-0 + 0-4-2 engine with high-pressure cylinders at the outer ends of the bogies. Garratt’s sudden death in 1913 meant that most of the development of this design was carried out by Beyer Peacock themselves. This firm would be the main builder of Garratts, although other builders like Henschel were licensed as well. The first Garratt, a 0-4-0+0-4-0, was built for Tasmanian railways. Against Garratt’s advice, it was designed as a compound locomotive and so the first Garratt had its cylinders at the inboard end of the bogies in order to keep the steam pipe between the high and low pressure cylinders as short as possible. This 'K1' is preserved and restored to running condition for the 600mm Welsh Highland Railway. Only one other Garratt was compounded, which was sent to the Burma Railway. All other Garratts had cylinders at the outer ends of the bogies. Before 1914, Garratts had been built for Western Australia Tasmania and to the Mogyana and San Paulo railways in Brazil. After the First World War three different types for the South African Railways were completed in 1920. From then on sales rose sharply and Garratts were built in ever larger number and dimensions. Two designs of Beyer-Garratt were used on British Railways, a 2-6-0+0-6-2 on the LMS, and a 2-8-0+0-8-2 on the LNER, in fact BR's most powerful engine. Elsewhere, the design was used throughout Africa, Asia, South America and parts of Europe, but not in the USA, where the Mallet reigned supreme. Beyer-Garratts can be seen in the UK on the Welsh Highland Railway at Caernavon, Wales, where South African 600mm 2-6-2+2-6-2s run. After the war there was a short but hefty revival in steam locomotive building. In the early fifties the most modern and mature Garratt design were produced, among which the various famous designs for the South African Railways. Production at Beyer Peacock ceased in 1958. Some other Garratts were built as late as 1966. In fact Garratt building continues until this very day if not on commercial basis. World wide about 1.800 Garratts were built, not a very impressive number compared to the huge numbers of Mallets (10.000 plus). But if you consider how late this design entered the market, it was virtually the last new concept of articulation, you will come to realize that it was against all odds very successful. One reason why the Mallet beat the Garratt in numbers is that de Garratt design never got hold on the North American market. US railroads frantically stuck to the Mallet concept for some reason, to my idea because the Garratt design didn't appeal to the American idea of how an articulated locomotive should look. "If its looks ain't right, it won't run either". 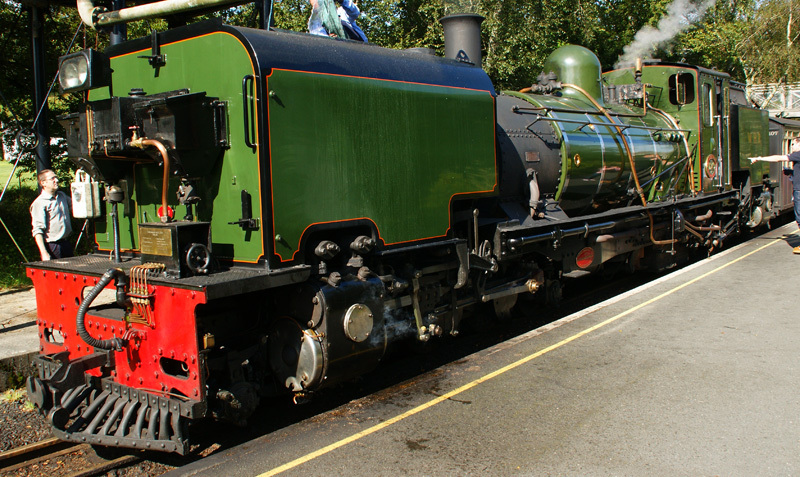 Another limitation on the number of Garratts was the very restrictive licensing policy of Beyer Peacock whereas the Mallet was built by virtually every locomotive builder. Yet despite all these factors, if it hadn't been for the decline of steam the Garratt design was a sure candidate to surpass the Mallet. Garratts on show at Glanypwll, Blaenau Ffestiniog 1997 when the Ffestiniog Railway put the Garratt locos on show for the WHR project. East African Beyer-Garratt removed from Museum East African 59 class Beyer-Garratt "Mount Gelai" is removed from Nairobi Railway Museum for overhaul to operating condition in August 2001. Garratt at Sandstone part 1. Garratt at Sandstone part 2.